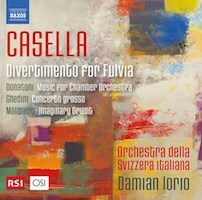 Alfredo CASELLA: Divertimento per Fulvia, Op. 64 (1940). Franco DONATONI: Musica (1954-55). Giorgio Federico GHEDINI: Concerto grosso (1927). Gian Francesco MALIPIERO: Oriente immaginario (1920). Orchestra della Svizzera italiana, Damian Iorio (cond.). Naxos 8.573748 (1 CD) (http://www.naxos.com/). “Now, And Then.” Girolamo FRESCOBALDI arr. Bruno MADERNA: Tre Pezzi (1952). Giovanni LEGRENZI arr. MADERNA: La Basadonna (1951-52). Giovanni GABRIELI arr. MADERNA: Canzone a tre cori (1969, 1972). Tomasso Lodovico da VIADANA arr. MADERNA: Le Sinfonie (1952). Unico Wilhelm van WASSENAER (formerly attributed to Giovanni Battista PERGOLESI) arr. MADERNA: Palestrina-Konzert (1952). Luciano BERIO: Chemins V (su Sequenza XI) (1992)*. Pablo Márquez* (guit), Orchestra della Svizzera italiana, Dennis Russell Davies (cond.). ECM 2485 (1 CD) (http://www.ecmrecords.com/). Coincidentally, we have the same orchestra offering six Italian composers each trying out styles not completely their own. You might think that the Italians invented music, such is their constant reassessment of the past. On both releases, the Orchestra della Svizzera italiana is clear and energetic. Naxos offers lesser-known 20th century composers, however Donatoni, who has been appreciated on these pages, is represented with a work written before his mature style. Casella’s Divertimento would have found a place in Diaghilev’s Paris. These perky orchestrations of piano pieces offer instant gratification and nothing durable. In Musica, Donatoni tries his hand at dodecaphony: “… my worst piece, sort of Schoenberg gone a bit neoclassical.” In actuality, there is nothing that compares to that latter brand from a tonal perspective; however, the repetition of motives indicates relaxed 12-tone pitch handling. There is no mistaking the antique leanings of Ghedini’s Concerto grosso, except that the reference point swings vertiginously from Baroque to Beethoven. The anachronisms are plentiful, but might escape the average listener. Malipiero dismissed his Oriente immaginario, a miniature three-movement suite with faux oriental chromaticisms whose overt caricatures would not be tolerated even in a cartoon score today. 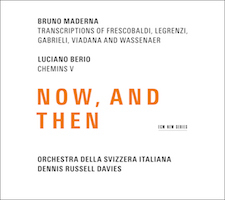 The ECM collection portrays the Janus-like stance of two more familiar modernists: Maderna curates and arranges music from centuries before and Berio revises himself. Maderna’s transcriptions of Frescobaldi, Legrenzi, Gabrieli, Viadana and Wassenaer (Palestrina-Konzert) are sensitive without being patronizing. They may not be historically accurate as lines and phrases are transposed and highlighted in new ways, but clarity is the aim, unlike Respighi’s heavy-footed Ancient Airs. Case in point, the opening Recercar super LA-FA-SOL-LA-RE (Frescobaldi), whose repeated motive is exchanged across different instrumental combinations, effortlessly haunts as Maderna adds and subtracts contrasting voices. Davies guides the Orchestra della Svizzera italiana with precision. With an opening clattering gesture a la flamenco, Berio’s expansion of his Sequenza XI (for solo guitar) startles mightily among Maderna’s reconsidered antiques. As with others in the Chemins series, the original solo part is surrounded with ensemble embellishments and contradictions. 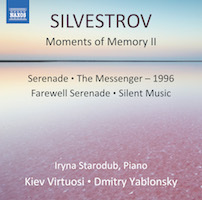 “Moments of Memory II.” Valentin SILVESTROV: Two Dialogues with Postscript (2002)*; Serenade for String Orchestra (1978); Farewell Serenade (2003); Silent Music (2002); The Messenger – 1996 (1997)*; Moments of Memory II (2003)*. Iryna Starodub* (pno), Kiev Virtuosi, Dmitry Yablonsky (cond.). Naxos 8.573598 (1 CD) (http://www.naxos.com/). 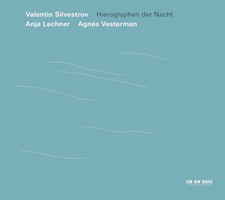 “Hieroglyphen der Nacht.” Valentin SILVESTROV: Drei Stücke (2002; rev. 2009)1; Elegie (1999)2; 8. VI. 1810…zum Geburtstag R.A. Schumann (2004)3; Augenblicke der Stille und Traurigkeit (2003)4; Serenaden (2002)5; Lacrimosa (2004)6; 25. X. 1893… zum Andenken an P.I. Tschaikowskij (2004)7; Walzer der Alpenglöcken (2004)8. Anja Lechner1,2,3,4,5,6,7 (vlc, tam-tam), Agnès Vesterman1,3,5,7 (vlc). ECM New Series 2389 (1 CD) (http://www.ecmrecords.com/). ECM and Naxos present two contrasting approaches to Silvestrov’s melancholy haloes. Curiously, the solo- and two-cello release is more dissonant and crotchety than the string ensemble’s fraying velvet. Silvestrov corners the market on post-tonal expressive meanderings. Everything sounds a bit familiar, like someone picking out Schubert’s Ave Maria from memory in an empty ballroom. There are harmonies lifted from the classical era: Two Dialogues explicitly cite Schubert and Wagner. It’s a particular syrup that not everyone will tolerate, although if Jenkins and Einaudi can support advertising, then so should Silvestrov. The Naxos program, whose leisurely pace hides the Kiev group’s precise refinement, makes mention of the pieces’ dedicatees. We should think of these pieces as conversations with friends, family, and other composers. To mention a few: The Messenger is dedicated to the composer’s wife, Larissa Bondarenko, who died suddenly in 1996; Silent Music is for the ECM founder / producer Manfred Eicher, and among the movements of Moments of Memory, the last, a Pastoral, is for the composer’s daughter. Unexpectedly, the cello pair may sound dissonant. Here stands the same wistful, solitary Silvestrov, but absent fleshy harmonies lifted from Schubert, the expressive line darkens quickly. As in the Naxos release, the ECM program strings together short pieces. Lechner projects great focus and deliberation. There are points where the music emerges as if improvised, except for the reassuring triads and the glancing appoggiaturas. The Serenades, with flowing cantilenas over pizzicati, might be outtakes from Villa-Lobos’ Bachianas Brasileiras. The Tchaikovsky memorial opens gloomily as the two instruments alternately tease out a melody. The trilogy’s remainder, a Wiegenlied and Serenade, balance a tune over plucked accompaniment. A few tracks reveal a less familiar side to the Ukrainian composer: The three-part solo Elegie could be mistaken for Scelsi, especially as it requires the cellist to strike two tam-tams, and the Alpine Bells Waltz asks for harmonics and col legno. 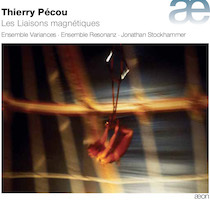 “Les Liaisons magnétiques.” Thierry PÉCOU: Les Liaisons magnétiques – Henri Dutilleux en mémoire (2013); Sextuor (2011); Soleil-Feu (2008); Les Machines désirantes (2008); Salsa d’Élissa (1998; rev. 1993); Dominica Reggae (2009). Ensemble Variances, Ensemble Resonanz, Jonathan Stockhammer (cond.). Aeon AECD 1546 (1 CD) (http://www.outhere-music.com/). 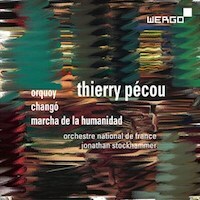 Thierry PÉCOU: Orquoy (2012); Changó (1992-93); Marcha de la humanidad (1997-2003). Orchestre National de France, Jonathan Stockhammer (cond.). Wergo WER 7318 2 (1 CD) (http://www.wergo.de/). Aeon offers an appealing collection of Pécou’s work which marries the French sensibility for color with all sorts of other-than-European influences. The assertive winds of Les Liaisons magnétiques lead quickly away from Dutilleux towards Xenakis. Sextuor (flute, clarinet, oboe, horn, bassoon and piano) was inspired by listening to Balinese and Javanese harmonies, but there are no explicit references in this single 17-minute movement. The two-part Les Machines désirantes ruminates upon Deleuze and Guattari, but we can ignore the program note and admire the vibrancy of this mini-concerto for piano, flute, saxophone, clarinet, violin and cello. Soleil-Feu for violin and piano may be the most conventional, its Mexican references obscure. In Salsa d’Élissa we are treated to a frisky Cuban son originally for clarinet and piano, here for saxophone, congas and piano. Dominica Reggae is a tiny encore, a “postcard” recalling a visit to Dominica. Wergo puts the pieces with more evident ethnic color at the front of the program. Its title is a Quechua word related to a shaman asking the gods to share their songs, Orquoy is a Varèsian exploration of potency and Caribbean themes. Stravinsky and Revueltas lurk at the edges in this large orchestral work, less so in Changó for three flutes and orchestra whose urge to writhe and swivel is held in check. Marcha de la humanidad takes its time as different instruments step up to the front for solos. A passage around the 11-minute mark that sustains and bends a unison suggests Scelsi, another composer admitting wide influences. Pécou asks musicians to look beyond the notes to find connections with other music and places. The Orchestre National de France seems slightly baffled, but they are led by Stockhammer who seems to be making Pécou a particular specialty.